Fire glass makes a beautiful accent to any fireplace or outdoor fire pit. Fire glass is a heat tempered glass that is processed through a tumbler to prevent sharp edges. It doesn't burn or break down and can be used for years and years. There are many different sizes, shapes, types, and colors of fire glass. Hopefully this guide will provide you a better understanding of your options. At Woodland Direct we have standardized the different sizes of fire glass into three categories: small, medium, and large. Small Fire Glass - 1/4": This fire glass is made of color infused 1/4" tempered glass. This size is considered to be the standard of the industry. It allows the glass to take on the look of liquid fire by allowing fire to flow underneath and around it. You can use one color as a base and include additional colors to create your own unique combinations. The small size of fire glass can also be used as a filler for some larger glass in the display. 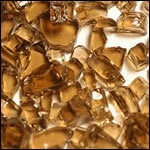 Medium Fire Glass - 1/2": Medium glass can be used by itself or as a covering over 1/4" fire glass or crushed lava rock. This glass is made from 1/2" thick tempered glass with infused color. Medium fire glass fits better in large fire pits as opposed to a smaller size. 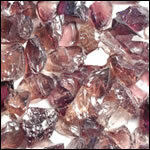 Large Fire Glass - 1"- 2": This is glass is the largest size available and resembles glass rocks. This particular size looks best as accent pieces in your fireplace. Large fire glass doesn't hold gas below its surface as well as smaller glass does, so keep in mind that you will have a smaller flame when using it. Like the other sizes of fire glass, it's also tumbled to prevent sharp edges and is made from color infused tempered glass. Accent Fire Glass- We recommend that you add this glass on top of regular glass to create a unique and dynamic look. Mix and match colors to create your own design, adding a personal flair to your decor. This fire glass is made by melting color infused, non-tempered glass into large bricks. Non-uniform pieces are chipped off using a grinder. The pieces are then taken and tumbled to remove the sharp edges. It also comes in a variety of colors for your choosing! 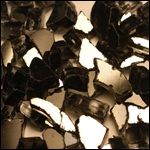 Reflective Fire Glass- Reflective fire glass offers an even more dynamic flame display then the other types. By reflecting the light of the flames, this accessory amplifies the intensity of the fire. During the day the glass continues to shine as it catches the light of the sun. Reflective fire glass is made from the same color infused tempered glass as our accent fire glass. However, reflective fire glass has been vigorously polished to give it a mirror like finish. 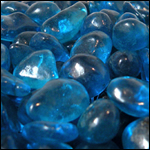 Smooth Fire Glass- Smooth fire glass resembles flattened marbles. It is made of a smaller and irregularly sized tempered glass. Smooth fire glass is color infused and has a fairly translucent finish. It also creates a less porous surface than even the small fire glass size. This means that the flames will flow under and around this glass, creating an even greater look of liquid fire. 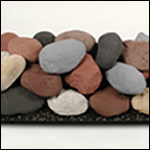 Fire Balls, Shapes and Stones- These balls, shapes and stones are an artistic alternative to ordinary ceramic logs. Whether you choose geometric shapes or natural looking stones, you are sure to turn your fireplace into a piece of art. These fireplace alternatives are made from high-heat resistant ceramic and come in many different sizes and colors. They work great by themselves or can be placed on to a bed of fire glass to create an entirely new look.